Something to amaze every one at our amazing maze! Our Amazing maze was planted in 1994. Since then gardens have been planted, rock walls erected, a pond completed, cafe, formal paths, other mazes and puzzles and a playground have been established. Something for everyone in our Family Friendly venue. The park area is approx 5 ha. 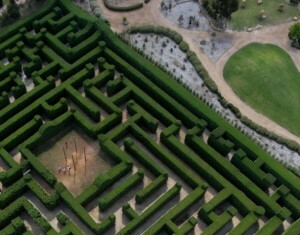 There are several mazes; the main hedge (Leighton’s Green) has 1.5 km of pathways and encompasses 1/2 ha of land. 5ha of stunning gardens with proteas, camellias, hibisus, native - too many varieties to name with something in flower all year round and birds and butterflies abundant.